Our honeybees produce the “good stuff”! 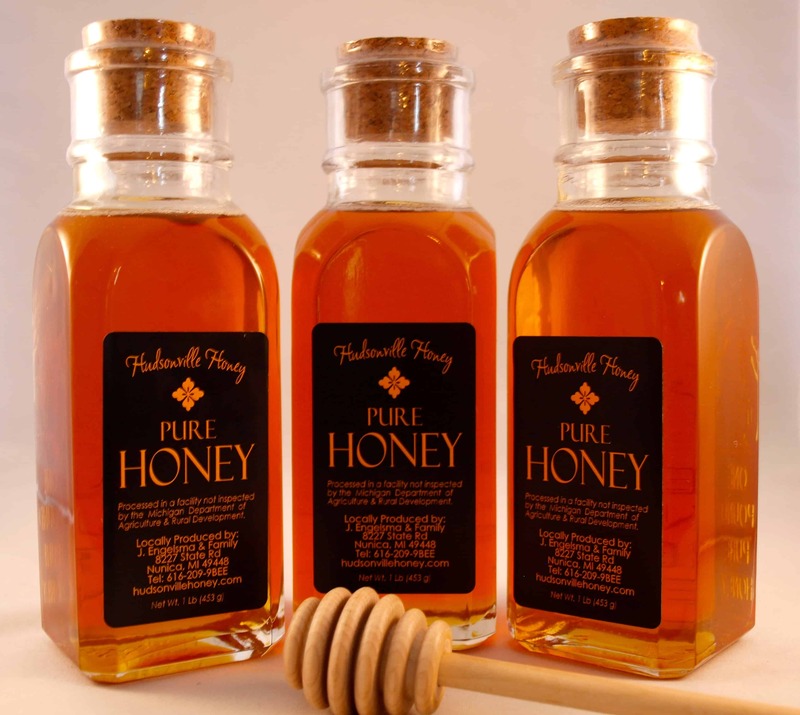 Simply put – the finest honey in the West Michigan area! We keep our hives healthy via integrated pest management, and harvest our honey by mid-summer making sure the final product is made from premium local nectar sources and healthy/safe for your consumption. Once you try our honey, your tolerance for the stuff that goes for honey at your local “big supermarket” store shelves will go down to zero. Our honey is perhaps best described as “sunbeams in a bottle”. While the color and flavor varies somewhat depending on what flowers the bees were foraging at the time it was produced, it tends to be a beautiful bright amber color with a deliciously mild flavor. The primary nectar sources in our area are the white Dutch clover and star thistle. Some years the bees will also produce honey on black locust and basswood. You can order our honey online, and we will ship it anywhere in the USA. If you live in the West Michigan area and would like to avoid shipping costs, just email us the product(s) you would like and we will notify when your order is ready to pick up. We are located in the Coopersville, MI area right between Grand Rapids and Muskegon. You can also find our honey at a number of West Michigan retail outlets – just scroll down a bit and you’ll see them listed below. We also sell raw honey still in the comb and chunk honey. We hope to have comb and chunk honey available again this coming June if all goes well. We also have a large assortment of hand made candles and lip balm made with pure virgin beeswax from our own hives. GVSU Farmer’s Market, 10am – 1:30pm, Wednesdays. June – October. The Red Door, Tue – Fri 11am – 6pm, Sat 11am – 4pm. 6837 Lake Michigan Drive Allendale, Michigan 49401. We also attend many local craft shows and exhibitions throughout the W. Michigan area. Follow our social media channels (Facebook, Instagram, Twitter) to stay abreast of our next show! If you have any questions you can call us Monday – Saturday, 8am – 6pm Eastern (616) 209-9BEE. Or you can email us anytime. sales@hudsonvillehoney.com.